Illuminating the path of egress with reliability, quality and innovation. Count on Dual-Lite emergency lighting and you’ll never be left in the dark. Ready, willing and able to light the way when emergencies strike, our emergency lighting lineup features high performance lamps, worry-free batteries and an optional, intuitive Spectron® diagnostic system. Easy to install, sturdy construction and aesthetically pleasing designs make Dual-Lite emergency lighting the premier choice for every environment. 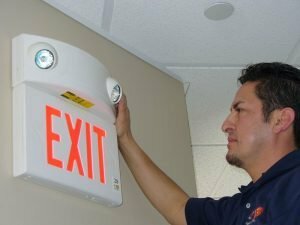 Because Dual-Lite plays an integral part in helping to craft safety lighting codes, our emergency lighting solutions meet or exceed all code requirements. Utilizing the latest technology and remaining dedicated to innovation, Dual-Lite continues to push the emergency lighting envelope for a safer tomorrow. 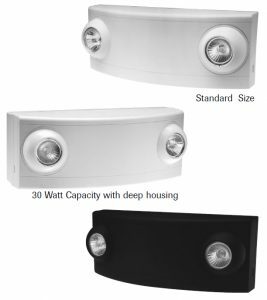 Application: The LZ Series is an indoor emergency lighting unit with 10 – 30W capacity utilizing a sealed lead-calcium battery in 6 VDC. Supplied standard with two halogen MR16 lamps. High-output LED based MR16 option provides increased spacing, additional run-time and/or increased remote capacity. Matching remote heads are also offered. The integrated lamp design offers greater protection from vandalism. Available in two housing sizes, one for standard capacity models (LZ2, LZ15) and increased depth for higher capacity models. Made from UV stabilized thermoplastic with a snap-together design in white or black finish. Includes test switch and AC-ON indicator. Unit mounts to 3½”, 4″ octagon or 4″ square boxes. Back-plate provides a universal knockout pattern for mounting to outlet box. Keyholes provided for securing housing to wall surface. 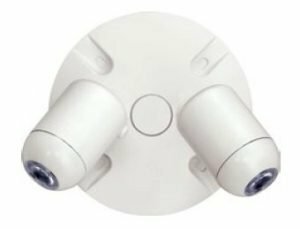 LZ2 and LZ15 can be ceiling mounted. All AC connections made inside unit housing. 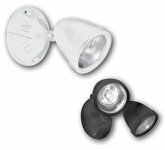 The LZ Series provides illumination with two halogen MR16 lamps positioned inside an adjustable “eyeball” style housing. Optional lamps for greater light output include 10W MR16 and maximum coverage high-output LED based MR16. 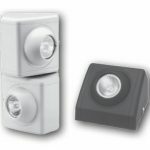 The EVR LED remote offers compact architectural design which matches the EV LED unit in size and performance. The use of a EVR2 remote doubles the multiple unit spacing, cuts down on AC wiring requirements and can be installed up to 50’ from the EV unit. 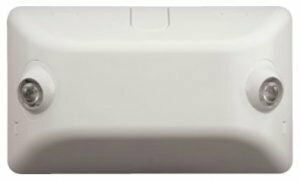 The EVR LED remote accepts DC input from an EV emergency light or EVC-D4 combo with remote capacity. The EVR2 is illuminated by 2 LED lamp-heads which are fully adjustable. The housing is made of UV stable thermoplastic with a light texture. The EVR matches the EV unit and EVC combo in color and texture. Available in White or Black finish. 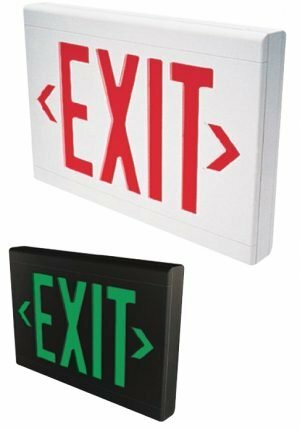 The EVR remote can be wall or ceiling mounted by use of a molded-in template and wired through the back-plate or conduit entry. The EVO outdoor LED remote is a single or double head LED based remote which accepts DC input from an EV emergency light or EVC-D4 combo with remote capacity. The EVO is best utilized as an over the door path of egress light for emergency operation. The EVO uses a single 3 watt rated LED per lamp-head and can be located up to 50’ from the external power source. Available in white or black corrosion resistant finish. Lamp housing and mounting plate are made of durable die-cast aluminum. The PGR offers LED performance in a remote fixture. Architectural style for indoor or outdoor application. The unit is illuminated by 4 high power LED’s arranged so that in the event of 1 or 2 LED failures the unit will continue to operate. The PGN accepts DC voltage which must be supplied from an external 6-12V DC emergency lighting unit. Housing and mounting plate are constructed of 1/8” die-cast aluminum and sealed with a 1/8” closed-cell silicone gasket. Housing finish is powder coated electro-deposition paint available in four colors: dark bronze, white, platinum silver and black. Remote can be wall-mounted by use of a universal molded-in template. Wired from the j-box through the back or through a conduit entry at the top. Architectural/commercial design. High performance MR-16 halogen lamps standard. Mounts to standard electrical boxes using universal mounting plate provided. Fixture housing mounts to back plate in a choice of four mounting positions. Housings secured using locking screws provided. Injection molded thermoplastic decorative lamphead and mounting plate assembly. Mounts to 3½” octagonal or single gang boxes. Single and twin lamp fixtures with MR16 lamp included. Standard finish is available in white or black. 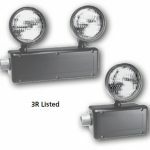 Outdoor UL Wet Location Listed die cast aluminum lamp head and mounting plate assembly complete with MR 16 lamp. Single or twin lamp fixtures available in dark bronze, black or white polyester powder coat finish. 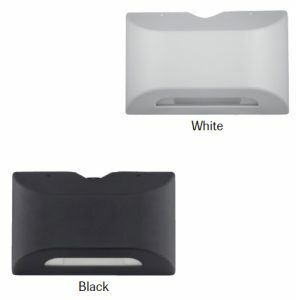 Mounts to 3½” octagonal or single gang boxes. Available with 5 watt lamps. Housing rated up to 50 watts. Injection molded thermoplastic lamphead/round mounting plate assemblies. Mounts to 3½” octagonal or single gang boxes. 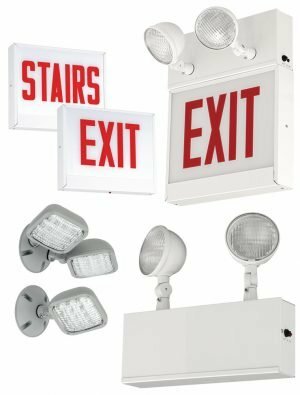 For use with most commercial or industrial emergency fixtures. Standard finish is available in white or black. 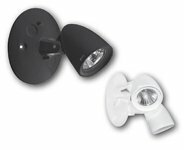 Single and twin lamp fixtures with a choice of incandescent or halogen PAR 36 lamps. Outdoor aluminum spot with sealed lamp and swivel assembly. Furnished with round gasketed aluminum mounting plate. Mounts to 31⁄2” octagonal boxes. Stamped aluminum housing with metal swivel. Standard finish available in white or black. Choice of incandescent or halogen PAR 36 lamps. Moisture resistant thermoplastic head in black finish with coated lamp terminals and sealed swivel assembly. Furnished with mounting plate. Available with a choice of incandescent or halogen PAR 36 lamps. Matches N4X series units. Suitable for wet and damp location applications. Rated for NEC Class I, Division 2, Groups B, C and D as well as Class I, Zone 2, Group IIB + H2 environments. Black housing and head assemblies. Single (C1D2R) and twin (C1D2TR) head models.